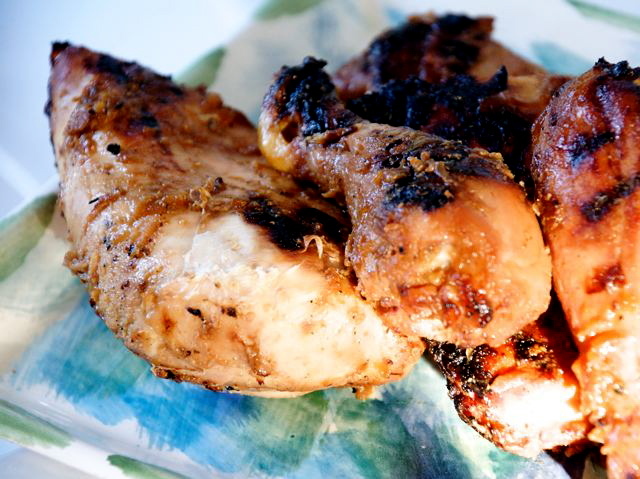 My friend Mary makes a delicious teriyaki chicken — tender, gingery, and not too sweet. The recipe comes from her mother-in-law, Alice Tucker, who lives in Hawaii. If you can't find fresh papaya (a natural tenderizer), replace it with 1/2 cup pineapple juice. In a medium bowl, mix together all the ingredients except the chicken and the rice. Place the chicken in a large zip-lock plastic bag. Add the marinade, squeeze the air out of the bag, and seal it; marinate in the refrigerator for at least 12 and up to 24 hours. In a shallow oven-proof pan, broil the chicken in the marinade until cooked through. Alternatively, remove the chicken from the marinade and grill it until cooked through. While the chicken is cooking, steam the rice. When the rice and chicken are ready, bring the marinade to a boil in a small saucepan. Pour the hot marinade over the chicken just before serving.